Home » Website Building » Weebly » How to Migrate Weebly to WordPress? How to Migrate Weebly to WordPress? Weebly is a wonderful platform to build a website in minutes and bring your online dream comes true. With one of the real WYSIWYG site editor, the expectation of any paid Weebly user is that the basic glitches will get improved over the period of time. It is really unfortunate to see that Weebly is going more towards making the platform commercialized with App Center and concentrating more on business users rather than addressing the basics needs. Why You Should Think of Migrating to WordPress? There are lots of drawbacks with Weebly like blog posts can’t be backed up, the archive can’t be uploaded back and creating a forum is not very easy. We received many requests from users that they were not aware of such limitations when they started building their sites. Now that they want to migrate to another platform but the site is grown in size and having more than 500 pages or posts!!! Their question is simple – Is there a simple way to migrate to any platform where backup is strong? It is also a very sad case that one of our clients mistakenly deleted the “Blog” page resulting in losing all the blog posts and asked us for a way to recover all the deleted posts. The moral of the story is simple – build your business with strong reusable backup which you should be able to restore in any unforeseen situation. And self-hosted WordPress platform is one of the strong options for site owners to migrate their Weebly site. WordPress.com is similar to Weebly, a free site-building platform with limitations. We are not going to discuss this in this article. WordPress.org is an open source self-hosted platform, which needs a PAID hosting, services to start building your site. Both versions use the open source WordPress software which can be freely downloaded from the WordPress.org site. WordPress is a top content management system in the world, you can download regular backup and keep it for emergency restore. The restore we mean is a real restore that your content can be reimported as it is with little effort. Though it is not guaranteed that with WordPress.org you will get a secured site-building platform, it is definitely an unmatchable beast compared to Weebly. Currently the pricing of individual Weebly Pro site costs around $12 and in our opinion paying $12 for a pro site is not much worth with lot of restrictions. Instead you can spend little time in learning WordPress and invest the same or even less amount of money on a paid shared hosting which is even available for less than $5 per month. Net to net we do not see any cost effectiveness with Weebly and you may also not get certain features in Weebly even you are ready to pay more. In other words WordPress offers paid hosting with almost any kind of features you can get for additional amount. An ecommerce page like a storefront and product pages. Generally a site is a mix of page, post and store, all content including store pages and blog index can be archived except the individual blog posts. If you have a content site along with a blog then there are two different steps for migrating content site and blog posts to WordPress platform. Besides you have a Weebly content site or blog, first you need to setup a WordPress site for migration. Go to Bluehost.com or any other hosting service and buy your preferred hosting plan. Install WordPress on a testing domain, generally offered with hosting plan. Learn more on installing WordPress on Bluehost, installing WordPress manually and installing WordPress on GoDaddy. You can install any of the free themes like the default twenty-sixteen theme or upload a theme from any commercial third party vendors. Now that you have a self-hosted WordPress site on a testing domain and the next step is to migrate your Weebly site to WordPress. First we will discuss about blog posts and then the content site. 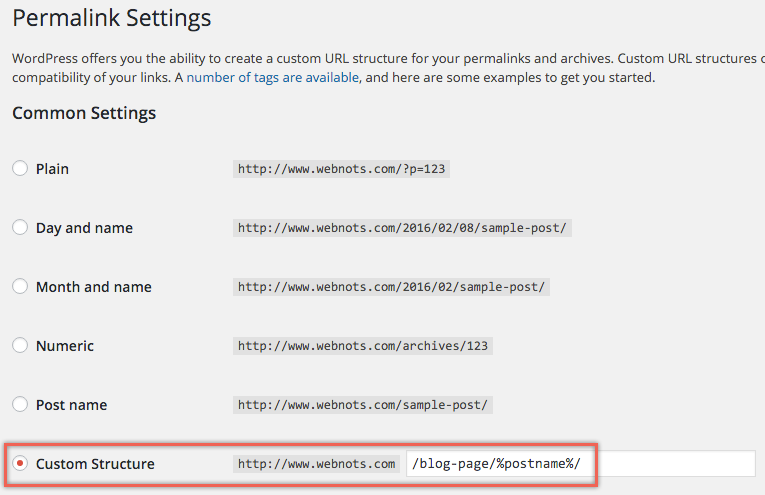 Weebly offers RSS feed for your blog posts with the URL as – “http://yoursitename.com/1/feed” OR “http://yoursitename.com/blog-page/feed”. 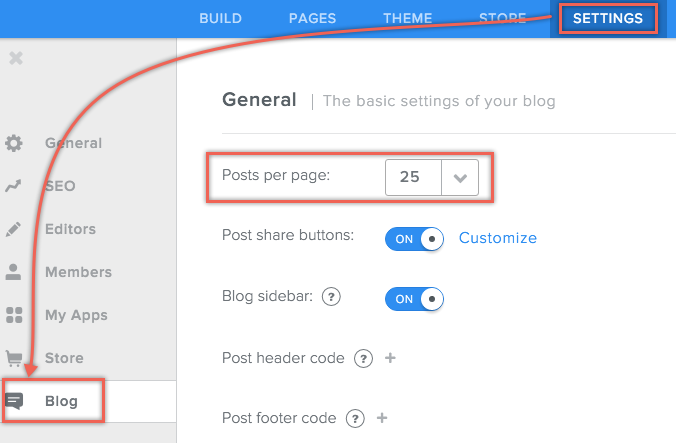 On your Weebly site, go to “Settings > Blog” and enable “Posts per page” to the maximum 25. This enables to display the last 25 posts on your RSS feed instead of the default 10. 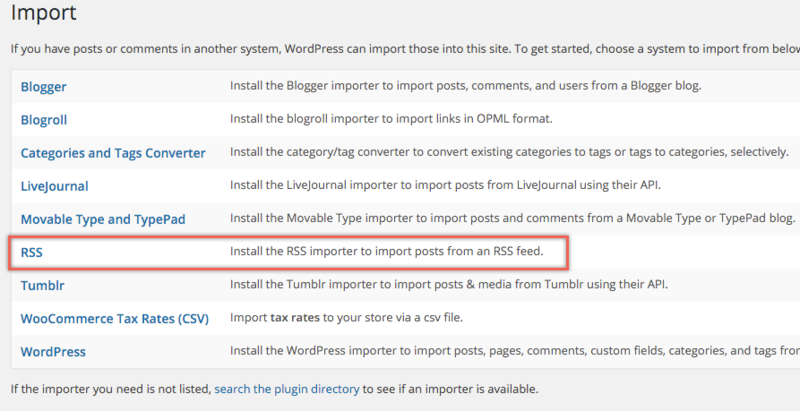 Now go to your WordPress admin dashboard and navigate to “Tools > Import”. Click on the “RSS” option to install RSS importer and provide your Weebly RSS feed URL to import the last 25 Weebly posts to WordPress site. If you have less than 25 blog posts, we strongly recommend following the manual migration as explained in the next step for content site. What if you have more than 25 blog posts? Before sometime Google Reader was there to extract all posts from the blog’s RSS feed. Unfortunately Google retired the tool and you need to find other solution now. There are free as well paid services available to import all your blog posts to WordPress which you can look for. Otherwise once the last 25 posts are imported, delete those 25 posts from your Weebly site to make the next 25 posts in to the feed. This was you can use the same feed URL to import 25 posts at a time and continue till the time you complete with all posts. Since the posts are imported through RSS feed, the images will be still hosted on your Weebly site. You can either manually edit blog posts and use the images which can be uploaded into WordPress site from Weebly archive or use a plugin to extract all the linked images on your blog posts. This plugin will help to import all images hosted on Weebly to your WordPress hosting server. But the problem here is any new posts created from WordPress site will also follow the same URL structure like Weebly blog posts. To overcome this, we recommend installing a “Redirection” plugin and setup 301 redirects from Weebly post URLs to a new WordPress URLs whatever you setup. This plugin is also useful for setting 301 redirects for your static html Weebly pages to a new WordPress URLs without extension. You can also setup 301 redirect from your hosting account including cross-domain and wild card redirects. If you have plenty of content pages then it is a painful task of migrating by copy and paste the content one by one page. The first step is to archive your Weebly site using the “Archive” option available under “Settings > General”. Enter your email id and click on “Email Archive” button and you will get an email notification when the archive is ready. It will take couple of minutes to hours depending on the size of your site and when the archive is ready you will also see the file under “Recent Exports” section with date and time of the archive. Click on the file and download to your local PC or mac. Basically you need all the images available under “Uploads” folder and all HTML pages with actual content. We recommend to cleanup the “Uploads” folder to keep only the required images and upload them into your WordPress site through admin dashboard “Media > Add New” or using FTP if you have huge number of images. The next step is to create one page by one and link the images from the WordPress media library like creating a new post / page in WordPress. Though there are plugins to import HTML page into your WordPress editor, we really do not see them helpful in exactly importing the content as it is. Since the content is created manually and the images can be used from the media library like a new site creation, it eliminates the problem of broken image links and broken absolute text links inside content. The only thing you need to take care for content site migration is to set 301 redirects from static HTML pages to WordPress permalinks settings as explained above under blog posts migration section. Though you can still use .html extension with WordPress we recommend to go with the pages without any extension. Once you have completed the migration, change the site URL from the testing domain to your Weebly domain under “Settings > General” menu. Ensure to enter a correct URL of your Weebly site – with www and without www are considered as two different URLs. Also change the DNS settings to point your domain to new hosting server’s IP address. Weebly uses relative links whereas WordPress uses absolute links. Hence, links of your text and images may not work as intended. Use broken link check tool to find and fix all broken links on your site after migration. If you have a habit of resizing images on Weebly site, then the “Uploads” folder of your Weebly archive will have lot of duplicate images. For example, the original image will be stored as “image_orig.jpg” and the displayed image will be stored as “image.jpg”. You need to cleanup those additional images which are not shown on the site before uploading to WordPress site. If you have bought the domain from Weebly, then you may need to do the domain transfer to the hosting company and change the DNS accordingly. If you have bought Google mail from Weebly, then ensure to setup the email with your WordPress site. You may need to do this from your Google account before domain transfer, since after the domain is transferred you may not be able access Weebly settings. Building a site is easy with Weebly but moving away is very difficult especially when you have lot of content. Think twice about the goal of your site before you start going with Weebly instead of struck up half the way. WordPress initially takes some time to learn but helps you to build what you like instead of going with restrictions. Importantly, for people complaining about security of WordPress, remember even the whole site is deleted or hijacked you have the backed up content and restore it in few hours which can’t be done with Weebly.